PHILADELPHIA - He came in like a wrecking ball. 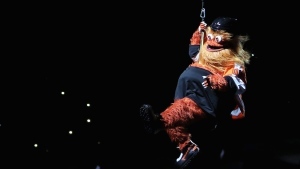 No, really, hockey’s biggest offseason addition - Philadelphia Flyers mascot Gritty, not John Tavares - swung suspended from the rafters like a wrecking ball as he dropped into his regular-season debut at Wells Fargo Center on Tuesday night. It was a monstrous night for the Broad Street Beast, who was born on Sept. 24 to reviews so ugly that he somehow became the internet’s most lovable fur ball in 12 hours. Not only was Gritty the most googled term in North America for the first day of his life but he also required a four-person security detail with earpieces at the Flyers’ home opener to manage the swooning Gritizens of Philadelphia. An entire row of stoic NHL scouts whipped out their phones to take photos of Gritty as he walked through the press box pregame. He was the Flyers’ unquestioned MVP as they were thumped 8-2 by the San Jose Sharks in their worst season-opening loss in franchise history. “Some of it comes down to Grit,” goaltender Brian Elliott correctly said postgame. But how did this all happen? Is Gritty’s popularity a case of accidental marketing brilliance or all part of the Flyers’ plan? Maybe a bit of both. HELLER: “Part of it was tradition. We haven’t had a mascot, so why did we need one now? The truth is we’d been talking about a mascot since the 2016 All-Star Game. We did over 100 different sketches. We figured no animal can represent who we are. We didn’t want to go into aviation. A human-type character doesn’t work unless you’re a university. We needed a monster-type creature. HELLER: "I remember walking in my door, sitting on my step and seeing the likes on Twitter – it was like 1,000, 2,000, 3,000 – it just kept climbing, all the way to 58,000 likes. It was blowing up; it was like, ‘Holy [bleep].’ I think that’s when Gritty started winning everyone over. Like a mother of any newborn, Schwab said she barely slept that first night.